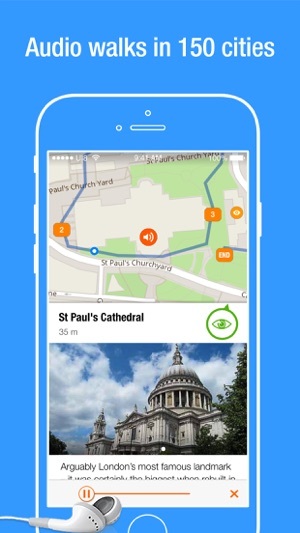 PocketGuide, the world’s leading audio city guide application, reveals the best stories, insider hangouts and must-see sights in more than 150 major cities and tourist destinations. 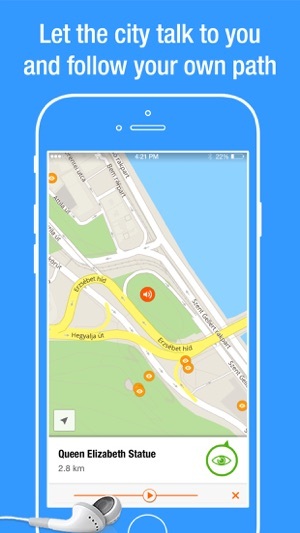 PocketGuide turns your mobile device into a personal tour guide: The GPS figures out where you are, and a voice recording, made by a local guide, describes the sights around you. You don’t need to read text from your phone, just listen and enjoy a city’s attractions while your virtual tour guide explains it all and shares personal insights. PocketGuide works offline, so you save on roaming charges, and it includes loads of critical reviews that help you decide where to eat, drink and shop. We also have fascinating themed tours, for those who want to go off the beaten path. Find the top tapas in Barcelona, get chic in NYC’s East Village or follow the trail of a 19th century serial killer in London. Whether you're interested in the main sights or "the road less traveled", PocketGuide is ready to take you there. Please note that continuous use of GPS running in the background can dramatically decrease battery life. Added support for tours in Arabic language. We would like to say thank you for your valuable feedback so that we can improve the application. We encourage everybody to send us your opinions about the application to help us create the best travel app for you. 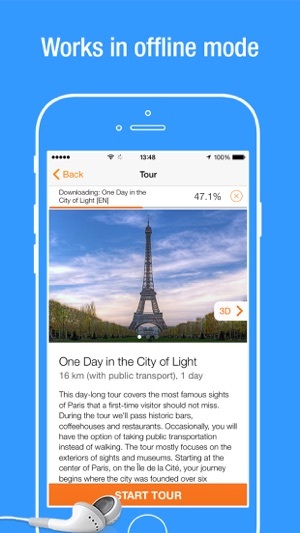 As others have noted the app provides the structure for individual guides to cities around the world. I tried Florence and was very impressed. I found it a comprehensive and entertaining guide to Florence. The commentary is casual and full of interesting and useful information--about the art and architecture and also about the street scene, places to eat or go for coffee or gelato. 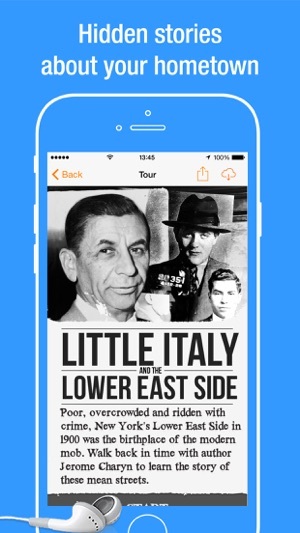 You can follow the suggested tour, or just let the app know where you are and let the commentary guide you. Since you can call up comments at will, you can use this guide to plan your trip in advance as well. All in all a very well designed app which I can see using for many cities as I travel. This Florence guide sets a high bar--it's remarkably good and I'll be checking to see if they have done as well with the other cities. I'm a roman tourguide and brought the rome in app, it was 7 tours for 5e, information is good, clean really from my experience it's what 80% of tourist taking large group headset tours want and is better then what they are getting without the large group and in my opinion this is superior. It's not better then a private guide. In the long run this will be doing private guides a favor though, by saving tourist huge amounts on overpriced mass group tours but allowing them a satisfying taste of all the city has to offer and they can then spend there money on a more in-depth tour of what interests them. Anyone flaming this app is more then likely a large group tour operator threatened by progression. Also if you want to see my own tour-guide work search 'romavita' in iTunes for a promo tour of the Sistine chapel. I purchased the Pocket Guide for Seoul and was using it today. It crashed a lot and could not react when I did not follow the route precisely (e.g., because of roadworks) and instead stuck on the next site in sequence, even though I could not there. I also found the tour of the palaces quite thin on information and would left me walking for 10-15 minutes with noting more than the occasional "continue to follow the your as show on the map". However more concerning was that I took a lot of photos inside the app, and even added captions to some, expecting they would be sitting in my iPhone photo folder when I finished but they are nowhere to be found. The concept is a good one but the execution is very poor.